MILWAUKEE, Aug. 6, 2018 – Employee-owned international financial services firm Baird has announced that Laura Thurow has been promoted to Director of Wealth Solutions and Operations, and will lead the combined Wealth Solutions and Operations groups for Baird’s Private Wealth Management business. In her new role, Thurow also serves as a member of Baird’s Executive Committee. Thurow is succeeding Russell Schwei, Chief Operations Officer and a member of Baird’s Executive Committee, who is planning to retire at the end of 2019 after almost 35 years at the firm. For the remainder of Schwei’s tenure at Baird, he will serve as a Vice Chairman and will pursue a number of firm-level initiatives while supporting the transition. Thurow joined Baird in 1999 as an intern in Baird’s Institutional Equities and Research business. 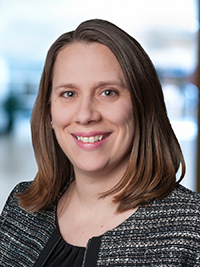 From 2000 to 2005, she served as an Equity Research Analyst before joining the Wealth Solutions Group for Baird’s Private Wealth Management business. Thurow co-led the Wealth Solutions Group for several years before assuming sole leadership in 2016. In her new role, she is responsible for the people, platforms and back office services that support Baird’s more than 850 financial advisors in all aspects of their wealth management practices. Baird’s Private Wealth Management business serves clients through 94 locations in 30 states and has client assets of more than $135 billion. Thurow holds an MBA from the University of Chicago Booth School of Business and received her bachelor’s degree in economics from Trinity College. She has earned the CFA charter and is a member of the CFA Society of Milwaukee. Schwei joined Baird in 1984 after working for Arthur Andersen. In addition to serving as Baird’s Chief Operations Officer, Schwei also served as Baird’s Chief Financial Officer in 1999 and Chief Information Officer from 2005 through 2009. He received his bachelor’s degree in accounting at Marquette University and attended the Securities Industry Institute at the Wharton School of Business. Baird is an employee-owned, international wealth management, capital markets, private equity and asset management firm with offices in the United States, Europe and Asia. Established in 1919, Baird has approximately 3,500 associates serving the needs of individual, corporate, institutional and municipal clients. Baird has $203 billion in client assets as of Dec. 31, 2017. Committed to being a great place to work, Baird ranked No. 12 on FORTUNE’s 100 Best Companies to Work For in 2018 – its 15th consecutive year on the list. Baird is the marketing name of Baird Financial Group. Baird’s principal operating subsidiaries are Robert W. Baird & Co. Incorporated in the United States and Robert W. Baird Group Ltd. in Europe. Baird also has an operating subsidiary in Asia supporting Baird’s investment banking and private equity operations. For more information, please visit Baird’s website at www.rwbaird.com.